Will Windows 9 be the OS of the future? OK, this is the Surface 3 - but what will the Surface 4 be like? The stars are aligning for Microsoft. They have the momentum, thanks to the wonderful Surface 3, to take back a significant portion of the tablet market. There are plenty of Windows-based tablets out there but it's the Surface - with its 2160 x 1440 resolution screen and Intel Core processors - that may ultimately give the Redmond-based company the upper hand. 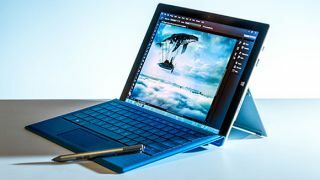 If everything goes as planned, after today the Surface could have a new operating system too: Windows 9 (Update: Pysch! It was really Windows 10) is set to be unveiled in the coming hours. And whether it can help Microsoft put the kibosh on iOS, well, remains to be seen. I sat down with MaximumPC Editor-in-Chief Gordon Ung to talk about what a potential Surface 4 could look like and, more interestingly, what our dream tablet would be.